We are proud to have schools that provide modern, integral education to underprivileged children and young people. For many years, our charity work has allowed hundreds of underprivileged children and teenagers to receive quality education based on values and principles. Thus, we are assuring a better and brighter future for them. Our goal is to raise young, successful entrepreneurs, with solid skills that will prepare them to join the labor force and the adult world. We grant full scholarships to the best students in our schools: Jose Domingo de Santistevan and Santa Luisa de Marillac. The latter offers young girls the opportunity to become nurse assistants at any of our hospitals, after graduation. 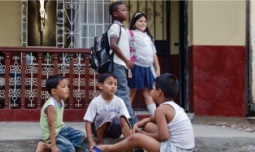 Similarly, our homes for girls Hogar Calderon and Asilo Manuel Galecio, offer housing, food, clothes, psycho-pedagogical support, and an education (elementary and secondary) while sharing good moral values with young underprivileged girls. Since 2000, more than 10,000 children have benefited from our work in all our schools and high-schools. Our schools are part of an ambitious educational program that seeks student's development in an integral manner, covering every important aspect of their development, while focusing on academic skills through high quality education. This will give them the tools to become responsible, hardworking professionals who are able to support their families in the future. Our schools offer specialized secondary education programs in nursing, computer science, accounting and management, electric engineering; and certifications in tailoring and dressmaking. Education is another area where we focus our charity work. Thus, we have Carlitos as an example, who sold candy on the street due to an accident which disabled his father. La Junta de Beneficencia awarded Carlitos a full scholar ship so he might study at the José Domingo de Santistevan Educational Unit. He is now receiving an education, uniforms, utensils, school bus transportation and an education based on values such as solidarity and love for your fellow man. You can also help to make more stories like that of Carlitos come true, so GIVE NOW.